Amortization has two similar but different meanings in business. Reduce the book value of intangible assets. pay off loans or other debt. It is interesting that the English word amortization has etymological roots in Middle English, Old French, and Latin words for "to kill" or "death" (mortem is Latin for death). It is not inappropriate to say that amortization "kills off" the loan or the asset value. What is amortization? Two different meanings in business. What is the meaning of amortization when referring to intangible assets? What are the major intangible asset categories? How are intangible assets amortized in accounting? Amortization as loan pay off or debt retirement. What is the nature of amortization payments? How do lenders and borrowers calculate amortization payments? How is loan pay off summarized in an amortization table? For coverage of the similar accounting practice, depreciation, see the article Depreciation Expense. For more on the nature of expenses of various kinds, see Expense. How is Value Assigned to Intangible Assets? Amortization refers to the accounting procedure that gradually reduces the book value(carrying value) of an intangible asset, over time, just as depreciation expenses reduce the book value of tangible assets. Asset amortization—like depreciation—is a non-cash expense that reduces reported income and thus creates tax savings for owners. For Indefinite intangible assets, owners expect to own them as long as the company is in business. For indefinite intangibles, there is no "end of life" in view. Generally, owners cannot amortize intangible assets, although regulators encourage accountants to re-evaluate the asset's indefinite nature from time to time. For definite intangle assets, however, owners expect to hold them for a limited time, or else they have a service life or economic life with a definite end in view. Definite intangible assets are eligible for amortization. The value of intangible assets in private industry can be genuine and large (see the article Branding, for instance). The company's accountants may be challenged, however, when trying to set the initial book value and amortizable life of intangible assets. The US Financial Accounting Standards Board (FASB) and comparable authorities in other countries provide detailed and specific guidance in this regard (e.g., FASB 141), which may refer to factors such as the recorded cost of purchased intangibles, expected impact on income, or the likely cost of creating another intangible asset of equal value today. Ultimately, however, these value judgments inevitably include a subjective component. Amortization of (definite) assets in this sense in this sense is almost always applied using the straight-line method. For a definite asset with a 10-year life, for instance, the amortization expense each year would be one-tenth of its initial amortizable value. The timing and rates of amortization expenses charged are called the amortization schedule (rather than depreciation schedule). Amortization expenses appear on financial statements like that used for depreciation expenses. Amortization appears on the Income Statement as an expense, like depreciation expense, usually under Operating Expenses, (or "Selling, General and Administrative Expenses). Amortization appears on the Balance sheet, accumulating from year to year to reduce asset book value, just as accumulated depreciation reduces the book value of tangible assets. Amortization is a non-cash expense, but it nevertheless impacts the Statement of changes in financial position SCFP (Cash flow statement). Under SCFP "Sources of Cash-Operating Activities," non-cash expenses including amortization and depreciation are "added back," (i.e., subtracted), so that the remaining total for Operating Activities represents only real cash inflow. for tangible assets, the depreciable value is usually the recorded cost less residual value. Definite intangible assets, however, are usually regarded as having no residual value, and so depreciable value is normally the full book value. When firms purchase certain definite intangibles for use over a limited time (e.g., usage of patent rights), the useful life is the amortizable life. For other definite intangibles, however, amortizable life may be the asset's expected service life or economic life. What is the Meaning of Amortization as Debt Retirement? What is an Amortization (Loan pay off) Table? The term amortization is best known as a reference to paying off a debt with regular payments (as in "amortizing" a mortgage, or "loan amortization"). In such cases, the debt pay off schedule is rightly called the amortization schedule. Payments are regular, i.e., borrowers pay at regular intervals, and all payments are the same (except sometimes for the final payment, which may differ from the other payments, to make the payment series total exactly cover what is due for interest and principal). Each payment covers interest due on the outstanding balance since the previous payment and then retires a component of the outstanding balance. P = principal, or the amount borrowed. i = interest rate per period. For instance, when the annual interest rate is 8% and the number of periods per year is 12, then i = 6% / 12 = 0.5%. n = the number of periods, or the total number of periodic payments to be made. i = 6% per yr / 12 payments per yr = 0.5% per payment period (month). 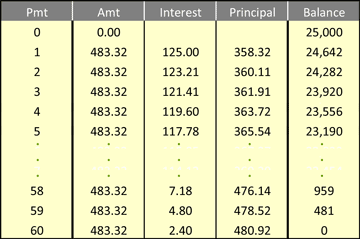 A small table created to facilitate calculation of A, the periodic amortization payment. Value cells in the right column have their names in the center column. Using the given example values, the monthly payment A is $483.32. How is Loan pay off Summarized in an Amortization Table (Loan pay off Table)? Beginning and ending rows of a loan pay off table for the 60-month loan example above. The full table includes 60 rows, one for each payment. How much of each payment pays for the period's interest. How much of each payment pays for reducing the balance due on the principal. The remaining principal balance due after each periodic payment. Such a table is of high interest to borrowers who may wish to pay off the loan completely at some point before the final period.